Ventoux wines are becoming more serious, and recently visited this place within the appellation, run by a delightfully eccentric english couple. James, the winemaker, is a serious cyclist, who welcomes fellow enthusiasts. 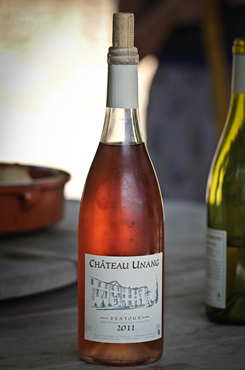 Wines are fresh and charming, so is the chateau, and all cyclists warmly welcomed! Taken from a comment in WineBookGirl blog by David Maddock who is the football correspondent for the Daily Mirror, who had a picnic here after having nipped up Mont Ventoux on a bike in record time!